I have always wanted to know how to make a card with one of my drawings on the front. After some fiddling, I discovered it was an easy task and I'm very pleased with my new selection of gift tags. One of my sisters has been giving me a handmade card for years and I have treasured each and every one of them. When someone spends the time to make something just for you, well, it's such a lovely gesture, isn't it? This is a photo of one of my own homemade cards. I think I need to point out here that these directions have nothing to do with scrapbooking. I don't have any scrapbooking materials, only my regular art supplies. My thought is that I only need to do a sketch on the front and maybe dabble with some watercolor pencils for added effect. I haven't had a lot to do with watercolor pencils up to now so it's all a learning curve that I'm ready for! 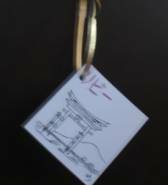 This gift tag is to accompany a present that I purchased, so it's only going to be small at roughly about 3 inches square. I chose water color and not colored pencil because I was seeking to create something quickly, just something simple with maybe a dash of color. Take the bottom of the page to meet up with the top and press along the fold to halve the page. Measure the width, divide by 2 and mark a light line down the center of the page to indicate where it folds itself in half. You now have 2 separate cards on one A5 sheet. Place the image on the right-hand side of the paper, using the bottom half first. When complete, cut it out to preferred size and carefully fold then press along the marked line at the center. If you want to thread ribbon or string, punch a hole in from the fold at the top left. Write your message on the inside. So, that's how to make a card - pretty simple, huh? My A5 paper (which is half an A4 size) makes 2 gift cards or 4 single layer gift tags. Each one measures 3 inches wide by 3.5 inches deep approximately. You can reduce the size more if you prefer. It's your choice whether you leave the paper in the sketchbook to do illustrations or you can cut to size first, it really doesn't matter. I had no clue how to make a card properly so this is simply the process I made up as I went along. Ok, now I think about the person the gift is meant for and I want to draw something of interest to that person. If you are a beginner artist, you need to compromise here and think of something that is simple enough for you to draw successfully and preferably something that suits the recipient. You also need to have an interest in the subject otherwise you will be reluctant to complete it. My first handmade card was for my eldest sister - she loves old buildings, animals, farms and anything to do with nature. I drew an old style gateway on the first attempt, I thought it came out great and then I realized I can't use it -- I drew it on the wrong half of the paper! As with everything, there is a learning curve to making gift cards! In hindsight, I can still use this sketch by cutting and pasting it onto a new surface, or I can use it as a single tag with writing on the reverse. 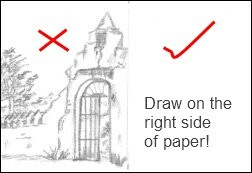 So, remember, if you want a folded card, images must go on the right-hand side of the paper! Next, I drew a rose but it wasn't the effect I was looking for so I kept experimenting until I was satisfied with the result. This rose was produced by going over a rough outline with a watercolor pencil. 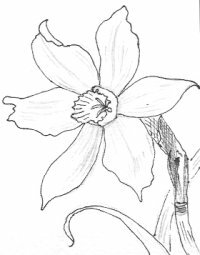 There has to be some thickness to the watercolor pencil so when the water is applied inside the outline, it can grab the color and run haphazardly into the petals of the flower. 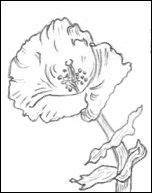 This next flower is a hybrid daffodil but I'm going to pass it off as some type of exotic flower to be colored however I like! Once my card was complete, I punched a hole in the top left corner. I threaded gold gift wrap ribbon through the hole and tied it to the handle of the parcel bag. So that's all there is to how to make a card! Remember to lightly sketch in the image and once you are content with the outcome, go over it with pen or pencil. There's no harm in using reference material, I still do it because I don't trust my imagination! If you use pen, make sure your drawing is completely dry before you erase any stray pencil marks. Use the eraser gently, watercolor paper is very sensitive. It's preferable to dab or blot the paper with a kneadable eraser so no damage is caused. Next up, was a gift for my niece who visited Japan last year and because she had a fabulous time, I thought it would be nice to have a Japanese theme on her card. I looked up Google Translate to find what her name represents in Japanese writing. To keep with the Japanese theme, I drew a Shinto Gateway. Actually, the landscape was so easy with a few scattered lines here and there. Put your initials in a discreet place near the edges of the illustration and make a copy of the artwork for your records. Now you have the basics of how to make a card, you stand to make an impression due to your efforts. To complete the card, you can find an appropriate verse by searching the internet. I don't use a copied verse because I like to write my own gratitude for knowing that person and what he/she means to me. Being a gift tag, a simple greeting on the inside will suffice for those who don't like to express feelings. I'm pretty sure the drawing on the outside will say everything you really want to say! Using your artwork for giveaways is an excellent way to showcase your talent and to grow as a true artist in-the-making. Please don't worry about what other people think of your work, if you like it (and don't forget, you are your harshest critic), it must be good! Practice the steps on how to make a card, don't procrastinate, give it a trial run! It is something that will be treasured by others plus you save money and have fun at the same time. When you teach yourself to draw, it opens up many pathways. You will likely spend some wonderful moments experimenting with all the different mediums at your disposal. This hobby also gives you the opportunity to venture into crafts you never dreamed you'd be able to produce. Really, you will never know what you are capable of doing until you set challenges for yourself. You now know how to make a card so who knows what you'll tackle next? Drawing is a hobby to be enjoyed and it's up to you (and me!) to make it so.